Traditionally manufacturers have forecasted demand for their products into the future and then have attempted to smooth out production to meet that forecasted demand. At the same time, they have also attempted to keep everyone as busy as possible producing output so as to maximize “efficiency” and (hopefully) reduce costs. Unfortunately, this approach has a number of major drawbacks including large inventories, long production times, high defect rates, production obsolescence, inability to meet delivery schedules, and (ironically) high costs. Non of this is obvious -if it were, companies would long ago have abandoned this approach. JIT is a production and inventory control system in which materials are purchased and units are produced only as needed to meet actual customer demand. In just in time manufacturing system inventories are reduced to the minimum and in some cases they are zero. a) Raw materials: inventories provide insurance in case suppliers are late with deliveries. b) Work in process: inventories are maintained in case a work station is unable to operate due to a breakdown or other reason. c) Finished goods: inventories are maintained to accommodate unanticipated fluctuations in demand. Higher quality- the removal of large batch manufacturing and reduction in handling often results in significant quality improvements; often in the region of 25% or more. Minimal inventory and waste- one of the main aims with any JIT implementation is to improve stock turns and the amount of stock being held. Personal experience has seen reductions of more than 90% stock in some industries. Along with the reduction in the stock come many other associated benefits. Reduced space requirements-by removing large amounts of stock from the system and moving processes closer together we will often see a significant reduction in the amount of floor space being used. Results from 100’s of projects run within companies in the UK through the Manufacturing Advisory Service saw average reductions of 33% for simple 5 day implementation projects. Reduced lead time- one of the most significantly impacted areas is that of the time it takes for products to flow through the process. Instead of weeks or months most JIT implementations result in lead times of hours or a few days. Simplicity- the use of simple pull systems such as Kanban, even with your suppliers, can significantly reduce the need for any form of complex planning. With many implementations the only planning is the final shipping process. 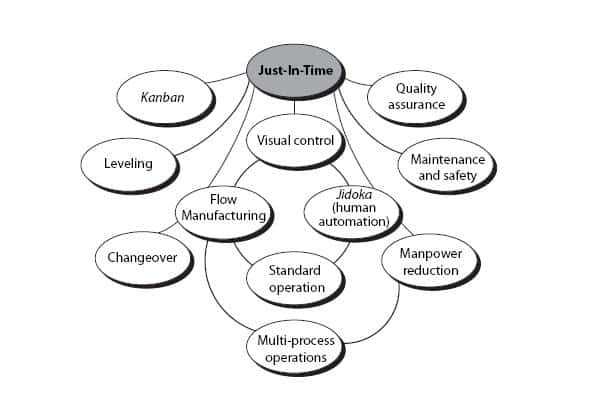 More workforce participation- one requirement of JIT as with most other aspects of Lean manufacturing is that employees are heavily involved in the design and application of your system.